Murali Parappuram known among the limited circle as a journalist is gaining popularity through his writings. His book on India's Prime Minister is gaining momentum with record selling while the demand is growing day by day. Titled 'Narendra Modi: Navabharathathinte Nayakan', the book is credited to be the first book in malayalam which features the biography of Narendra Modi. The book published on 13th December 2013 by Justice V R Krishna Iyer has sold more than 11,000 copies. Buddha Books, the publishers of the book has already made their presence alive with this single book. Launched in May 2013, the company based in Angamaly was looking forward for an opening in the book world. The sales of the book went like a rocket soon after Narendra Modi became the prime minister of India. A T Santhosh Kumar, the managing director of Buddha Books says that, the company received 826 calls in a couple of days demanding the book. Being the first malayalam book on the life of Narendra Modi, 'Narendra Modi: Navabharathathinte Nayakan' got well reception from the reading community which really popularized it. The announcement of Modi as the prime ministerial candidature by the party ignited the sale of his biography. Murali Parappuram, the editor of Janmabhumi should be praised for his tired less effort to compile this book. The book starts with the account of Vadnagar, the birth place of Modi and ends with the announcement of Modi as the Prime Ministerial candidate. The book would give an insight about the leader who rose to the position of Indian Prime Minster with his devoted mind to serve the public. 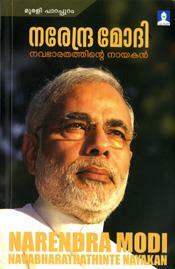 Narendra Modi: Navabharathathinte Nayakan' has 22 chapters and a full-length interview of Modi. Chapters like 'Modinomics', 'Person and Views', 'Namo Yuga' would keep the readers intact. With 248 pages worth for reading, the book is priced at Rs 200 for a single copy. Currently more than 60 titles in different languages about the life of Narendra Modi are available.